Does IACS need “extra” Extra Help? Extra help has always been a resource at IACS. Every teacher has a weekday that they stay late for an extra hour after school to offer assistance to any student that might need it. Most students at IACS have been to an extra help session, whether they were required to come to make up something for a teacher, or needed clarification on concepts taught in class. Extra help can be an important tool for both the student and the teacher. Author Jane NealeyPosted on October 27, 2015 November 12, 2015 Categories FeaturesLeave a comment on Does IACS need “extra” Extra Help? Monday, March 16 marked the beginning of the track and field season for this school year, and since then, heading towards the end of the season, the track team has seen records, state qualifiers, and other great accomplishments. IACS’ track team has competed in nine meet thus so far: three dual meets at IACS’ home track, and six of larger invitationals. The team has had several top performances this year, with Senior Connor Felty winning shot put and coming in second place in discus at the Sunset Invitational, after coming in second place in the same two events at the Nashua North Invitational. Sophomore Jane Nealey also placed second in discus at the Freshman/Sophomore Invitational, and Sophomore Rebecca Kearns threw a school record in javelin at a home meet, and then later broke her record at the Sunset Invitational. In running events, Senior Nicholas Scarsdale won the 400 meter race at the Sunset Invitational, and placed second in the same event at the Coaches’ Invitational. The boys 4×400 meter relay team (a relay race with four athletes, each running 400 meters) also won the event at the state relay meet, running the fastest time by a Division four team in the 4×400 meter race since 2009, only missing the meet record by 0.9 seconds. Later into the season, the Massachusetts Interscholastic Athletic Association (MIAA) decided to lower some events’ qualifying standards for different divisions’ respective state meets. This change was due to a lack of athletes who had qualified, and the standards were lowered to reach the target number of entrants (15-18) in each event in each meet. As of May 27, the team has fifteen individual athletes and three relay teams who have qualified for the Division Four State Meet, eleven individual boys athletes, and four individual girls athletes. The boys qualifiers are Junior Cedric Nsilo-Swai in the mile, two-mile, and triple jump, Senior Timothy O’Neill in triple jump, Senior Connor Felty in shot put and discus, Senior Marc Printz in the mile and the 2 mile, Sophomore Nicholas Passarelli in the 2 mile, Sophomore Calvin Lee in the mile, Senior Nicholas Scarsdale in the 100 meter, 200 meter, 400 meter, and 800 meter races, Sophomore Victor Silva in the 800 meter, Senior Lee DiMattia in the 200 meter and 400 meter, Senior William Paulo in the 400 meter, and Junior Jack Panneton in the 400 meter race. The girls who qualified individually were Sophomore Jane Nealey in the discus throw, Sophomore Maria Frey in triple jump, long jump, and 400 meter hurdles, Senior Alyssa Brodeur in pole vault, and freshman Rebecca Reynolds in the 200 meter race. Three relay teams also qualified for the state meet, one girls 4×400 meter, one boys 4×400 meter and one boys 4×800 meter team. The boys 4×400 meter team consists of Seniors Lee DiMattia, William Paulo, and Nicholas Scarsdale, and Junior Cedric Nsilo-Swai. The 4×800 meter team consists of sophomores Calvin Lee and Victor Silva, and two other athletes yet to be determined. The girl’s 4×400 meter relay includes Freshman Rebecca Reynolds, Senior Melissa Morris, and Sophomores Maria Frey and Bianca Trujillo. Records that have been broken this season are girls javelin school record, boys 4×400 meter relay, and six sophomore class records. Sophomore Sarah Mayotte broke the sophomore record in the mile by eight seconds- running the 1600 meter race in 6 minutes and 7.4 seconds, a 22 second personal record (PR) for her at the first meet of the season, and later improving that record by three seconds more, with a run of 6 minutes and 4 seconds at the last home meet of the season . Mayotte also broke the sophomore class record in the 800 meter and the two mile run, running 2 minutes 48 seconds, and 14 minutes 16 seconds, respectively. Sophomore Bianca Trujillo ran a sophomore record of 28.6 seconds in the 200 meter race, and sophomore Nicholas Passarelli also ran sophomore records of 4 minutes 48 seconds in the mile run, and 10 minutes 30 seconds in the two mile. Sophomore Maria Frey also ran a sophomore class record in the 100 meter hurdles at 19.2 seconds, and jumped another sophomore record in triple jump, with a jump of 27 feet 6 inches. At the second meet of the season, Sophomore Rebecca Kearns broke the girls javelin school record with a throw of 59 feet 9 inches, and then broke that record two meets later at the Sunset Invitational, with a throw of 71 feet 5 inches. The first meet of the season, a dual meet at home on April 8th was cold and rainy, with some of the field events (discus and javelin) being canceled due to the weather. Both IACS’ girls and boys teams lost to Francis W. Parker Charter Essential School, which was largely due to lacking some key athletes, and not being at full strength. The second meet, which was also at home, against North Central Charter Essential School (Sizer School) on April 14th, was more successful. Both the girls and the boys teams defeated Sizer school. 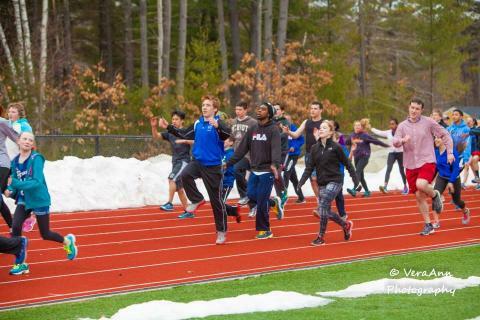 Other meets that the IACS Hawks have competed at were the Freshman/Sophomore Invitational in Hingham, MA on April 25, the Nashua North Invitational on April 25, and the Sunset Invitational on May 2. In the last home meet of the season on Wednesday, May 20 against Advanced Math and Science Academy (AMSA), IACS’ girls team lost, and our boys team won. This meet was important because athletes qualified for states, and others who had already qualified improved their performance. Distance events coach Federico Pereyra has a positive outlook going into the rest of the season, setting goals for both the girls and the boys team. 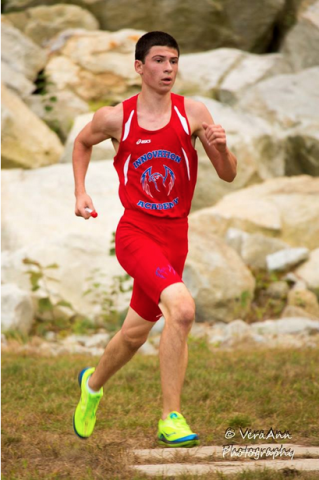 “On the boys side, our goal is to continue to improve on our team finish at states. We were 33rd in 2013, 14th in 2014, and are looking for a top 10 finish this year. We have a core group of experienced seniors who will want to end their high school career with strong performances. We also have some talented underclassmen who are looking for an opportunity to make their mark on the program. On the girls side, last year we had 5 individual state qualifiers. We are hoping to match or improve on that number. Additionally, we’d like to have everyone see improvements in their main events. We also have had some newcomers which have been contributing members, in their first high school season, which doesn’t hurt.” said Pereyra. The Division 4 state meet will take place on May 31st, so keep an eye out on theinnovator.org for how the team did!